The King of the Fairies and the Air, and the husband of Titania, the Fairy Queen. He rules over moonlight, dreams, and all fairy rites. He first became widely known when he appeared as a character in Shakespeare's "A Midsummer Night's Dream." Although he has the face of a handsome young man, a curse has made him no taller than a three-year-old child. He is polite and sometimes even friendly towards humans. Oberon is known as a selfish, short-tempered ruler, often falling in love with human women only to be restrained by his queen Titania. The two are said to have once lived in India, and would cross the sea to Europe at night to dance in the moonlight. 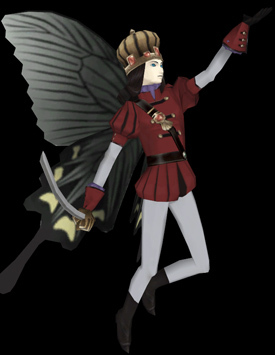 Fairy King who although feared his wife's gaze, has a strong affection for her. Damage from Demons of the Fairy group is decreased 30%. When Titania is in the same party: +20 SPD, +10 STR. A demon with a strange cap. Charge-based damage is negated at 3% for every earned XP level. Fairy who assists crafting in accordance with Intelligence and LCK. This page was last modified on 26 August 2018, at 20:29.